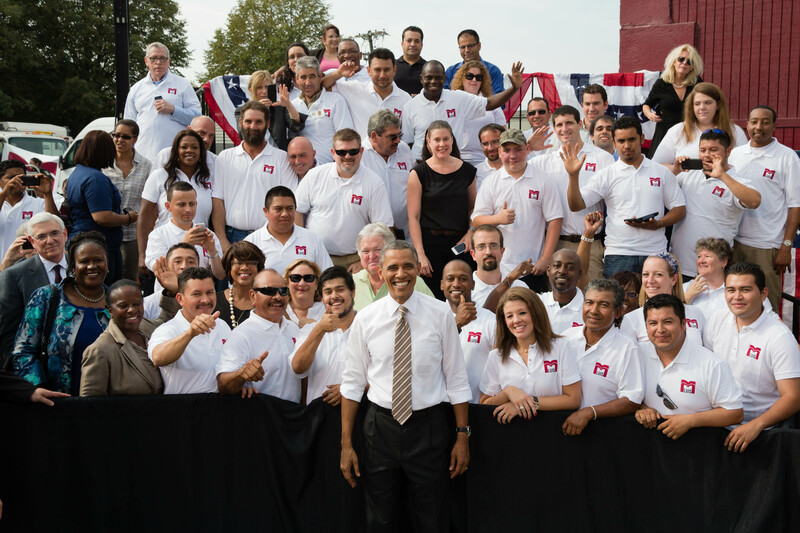 BALTIMORE, viagra MD – President Barack Obama spoke to a gathering of the press, employees and guests of M. Luis Construction today at their Rockville, Maryland asphalt manufacturing plant. With the plant as a backdrop, he used the public forum to pressure House Republicans to end the government shutdown, while highlighting the role of businesses like M. Luis in the economy’s recovery over the past three years. “We’ve added 7.5 million more jobs, and more small businesses have gotten loans to grow and hire with help of the Small Business Loan Act I signed three years ago. That program is part of what allowed M. Luis to grow. We’ve made steady progress and we can’t afford to threaten that progress right now with a government shutdown,” the President said. M. Luis’s plant produces up to 300 tons of asphalt per hour, while the construction division has laid over 750,000 tons of asphalt over the last three years. “Because the majority of our work is publicly funded, the federal government shutdown will significantly – and quickly – impact our ability to keep our plant operating, our crews working, and our vehicles running,” said Cidalia Luis-Akbar, M. Luis president. The President noted that M. Luis and government subcontractors like it across the country are worried their work will stop and are unsure of how the shutdown will impact the economy. One immediate effect is the inability to get Small Business Administration loans processed, a significant economic catalyst. Its non essential workers have been furloughed due to the economic shutdown. “The SBA gives billions of dollars in loans to small businesses across the country, but right now they can’t be processed because there’s no one there,” he said. M. Luis was the beneficiary of one of those loans. In 2010 they were awarded a $2.5 million Maryland Industrial Development Financing Authority (MIDFA) loan guarantee made possible by the State Small Business Credit Initiative (SSBCI). “The loan guarantee, and Eagle Bank, enabled us to continue to expand operations and integrate the previously construction-focused company with asphalt and aggregate manufacturing,” said Natalia Luis, M. Luis vice president. Robert Agarwal, Director, Executive Sounding Board Associates Inc.
Sandy David Baron, Partner, Shulman Rogers Gandal Pordy & Ecker, P.A. Robert Katz, Managing Director, Executive Sounding Board Associates Inc.
Al R. Roshdieh, Deputy Director, Montgomery County Department of Transportation • Martin Schaffer, Partner, Shulman Rogers Gandal Pordy & Ecker, P.A.